Despite being only 30 percent contained, Caltrans work crews and contractors are now entering areas burnt out by the Carr wildfire in northern California – now considered to be the ninth worst in state history – to catalog the damage done to transportation infrastructure by its flames and heat as well as to begin repair efforts. The Carr fire – named after where it started, at the intersection of U.S. Highway 299 and Carr Powerhouse Road in the Whiskeytown–Shasta–Trinity National Recreation Area – covers 112,888 acres in and around the city of Redding and has so far destroyed 965 residential structures and left six people dead. 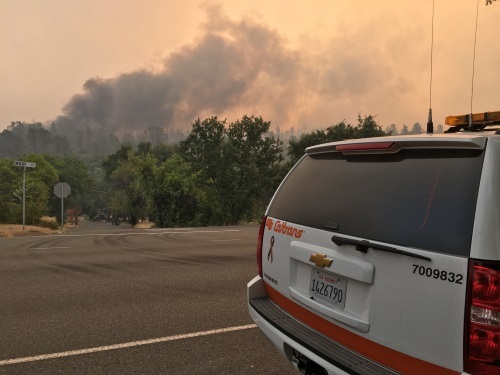 Don Anderson, deputy district director for maintenance and operations in Caltrans District 2, told the AASHTO Journal that 27 miles of Highway 299 remain closed due to the wildfire, with passage granted only to firefighters, emergency personnel, and utility crews. As that highway is a main east-west artery, detours are “significant” and “create a lot of havoc” for travelers in the region, he said, but so far, freight traffic remains relatively normal into and out of the area. Caltrans recently approved a $24 million contract to begin assessing the damage to guardrails and highway signs, as well as to remove burnt trees that may threaten to fall onto roadway areas. “We also lost a small weigh station along the highway as well that we’ll need to replace,” Anderson said. Roger Lucas, one of the maintenance managers on Anderson’s team from Caltrans District 2, added that four Caltrans crews are currently working in areas already burnt out by the Carr fire in 12-hour day and night shifts – cataloging the “hundreds” of road signs destroyed by the fire as well as examining potential roadway damage caused by fire suppression efforts.